Of the four counties the Oregon Territorial Legislature created on December 22nd, 1852, the westernmost was Jefferson. At the time of its creation, Jefferson County covered the northern end of the Olympic Peninsula. As we saw with King County, population played no role in county creation. Even by 1860, the population of the County was merely 531. 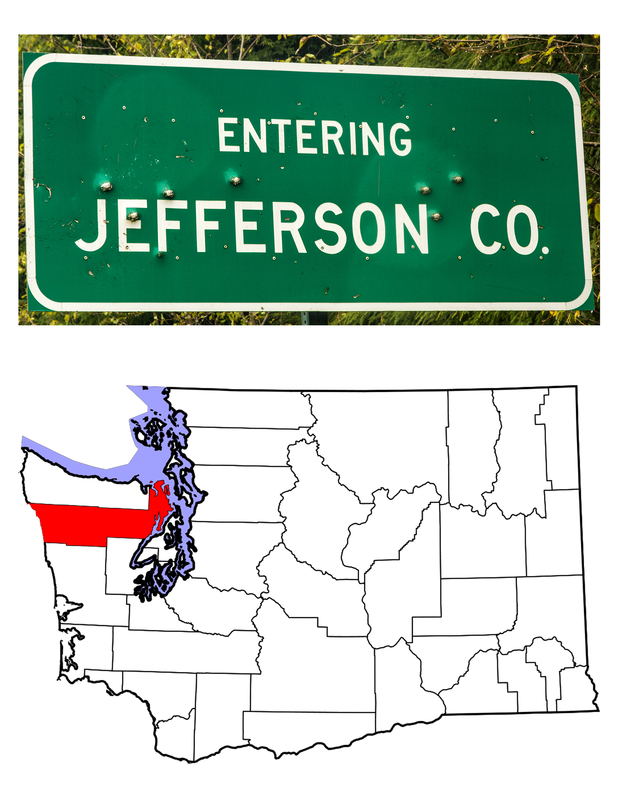 The Legislature quickly joined Jefferson and neighboring Island Counties for “judicial purposes.” The following post will look at the history and geography Jefferson County, Washington, including its Pacific Coast, Olympic National Park, and the populated eastern side of the County. An attempt to “rectify” the error occured on January 29th, 1868. On that date, the Washington Territorial Legislature created Quillehuyte County from the western parts of Clallam and Jefferson Counties. Some feel that the creation was designed to shore up white claims over the Native population. This time, however, the lack of population was too egregious to ignore. Quillehuyte County ceased to be on December 2nd, 1869, its land reverting to the original counties. Today, most of the population of western Jefferson County is Native American. 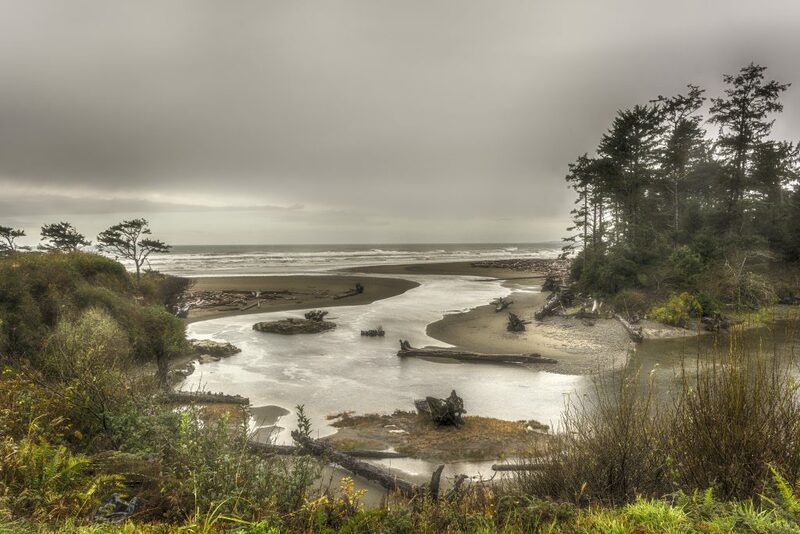 The Hoh Reservation lies at the mouth of the Hoh River. The Quinault Reservation, located mostly in Grays Harbor County, extends into southwestern Jefferson County. 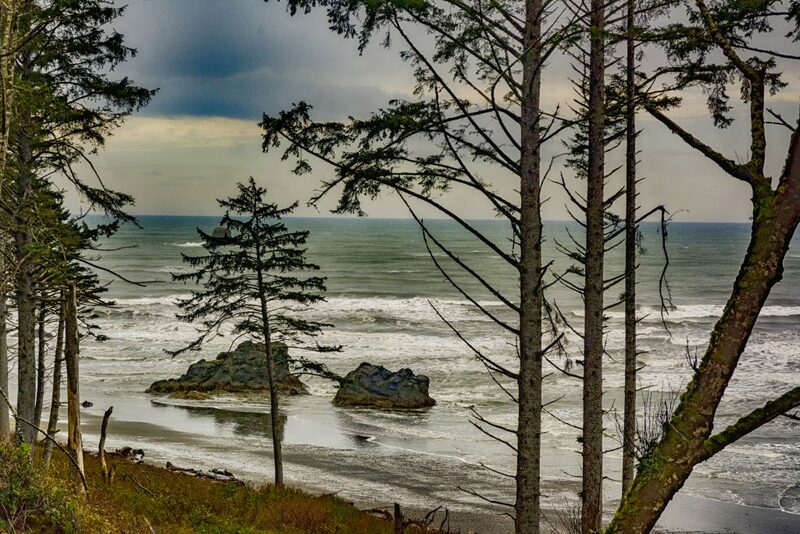 The only mark on the highway 101 map between Queets (a Quinault community on the Grays Harbor County line) and Forks (in Clallam County) is Kalaloch, a resort overlooking the Pacific. Most of Olympic National Park lies within Jefferson County. And all of central Jefferson County lies within Olympic National Park. While Native people have lived in and around the park for millenia, whites “discovered” the area beginning in the 1880s. Naturalist John Muir was one of those who called for a national park to preserve the area. In 1897, President Grover Cleveland designated the Olympic Forest Reserve to protect the forests of the region. In 1909, President Teddy Roosevelt named a portion of that Reserve Mount Olympus National Monument. His stated reason was to protect the Roosevelt Elk, then in sharp decline. Finally in 1937, Teddy’s cousin, President Franklin Roosevelt signed into being Olympic National Park. In 1953, the Park added a coastal portion, virtually all of coastal Jefferson County. 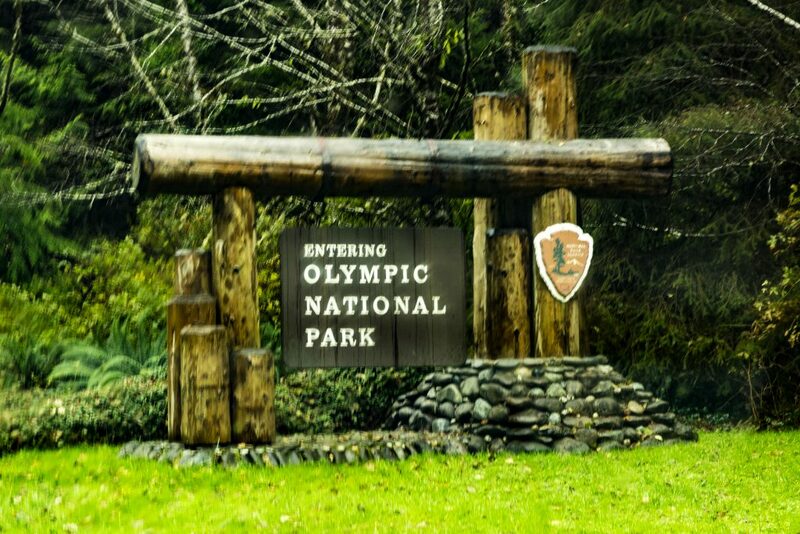 Olympic National Park covers 922,650 acres or almost 1,442 square miles. Mount Olympus, at 7,980 feet above sea level, marks the highest point in the Park. Sea level along the Jefferson County coast, is, of course, the lowest. The Hoh Rainforest on the western side of the Park may be the wettest place in the continguous 48 states. It receives on average 150 inches of precipitation each year. The eastern side of the Park lies in a rain shadow, relatively dry, especially given the rainy reputation that much of western Washington shares. There are over 20 endemic species living in the Park–species that exist nowhere else. From the glacial peaks to the rocky beaches, you have plenty of recreational and sightseeing adventures waiting in Olympic National Park. The populated area of Jefferson County lies along the varied waters of Puget Sound. Largely a collection of peninsulas and islands, much of the area preserves the names given by George Vancouver on his 1792 expedition. Starting at the northwestern corner, Discovery Bay is split between Clallam and Jefferson Counties. Vancouver’s ship gave its name to Discovery Bay, a body of water capped by Protection Island, a wildlife sanctuary in the Strait of Juan de Fuca. Vancouver named Protection Island, as well as Port Townsend Bay, which in turn gave its name to the only city in Jefferson County. Port Townsend’s peninsula retains the Spanish name given it by Juan de Fuca who explored the area two years before Vancouver. Manuel Quimper, Peruvian-born, commanded de Fuca’s ship Princesa Real and charted both north and south banks of the Juan de Fuca Straight. Vancouver gave English names to most of what de Fuca had already named. Both ignored the Native names. American explorer Wilkes renamed the Peninsula. He preferred the name Dickerson, but the U.S. Coast Survey reverted to Quimper. Roughly eleven miles long and mostly less than four miles wide, Quimper Peninsula hosts not only Port Townsend, but also the communities of Port Hadlock, Irondale, and Chimacum, all of which lie southeast of the County Seat. Marrowstone (again, a Vancouver name) and Indian Islands lie east of the Quimper Peninsula, between Port Townsend Bay and Puget Sound itself. A highway bridge connects Indian Island to Quimper Peninsula, and a second bridge connects the two islands. The Indian Island Naval Reserve covers the entirety of Indian Island, and no civilian resides on the island. As a naval munitions handling facility, the island features on the radar of both environmental and peace activists. Continuing east on Washington Highway 116 across the Kilisut Harbor causeway, you arrive on Marrowstone Island. Long and narrow, Marrowstone Island has one named community, Nordland, one zip code, 98358, and one general store. It does have farms, a vineyard, a boat dock, and a state park where once Fort Flagler protected Admiralty Inlet and Puget Sound. Most of Jefferson County’s farmland lies in the southeastern section of the County. Betty MacDonald’s 1945 book The Egg and I depicted the area around Chimacum. MacDonald’s humorous memoir grew into the 1947 movie of the same name starring Fred MacMurray and Claudette Colbert. Two of the secondary characters in the movie became a movie franchise of their own. Ma and Pa Kettle starred in eight subsequent movies and featured in law suits claiming the characters defamed actual Jefferson County residents. The MacDonald’s farm raised chickens (not surprisingly given the name of the book). The road past that farm has been renamed Egg and I Road. Even today, poultry in all its many forms remains an important part of Jefferson County’s agriculture. And the law suits? The first settled out of court and a jury found for the defendents in the second. Two long peninsulas reach south from the Chimacum and West Valleys. The Toandos Peninsula separates Hood Canal from Dabob Bay and the much shorter Bolton Peninsula separates Dabob Bay from Quilcene Bay. The “Census Designated Place” known as Quilcene lies at the corner where Jefferson County turns west toward Olympic National Park and the Pacific. The 2010 Census counted 596 people in the unincorporated community which from 1984 to 2016 hosted the Olympic Music Festival (now resident at Fort Worden in Port Townsend). Quilcene is also home to one of the world’s largest oyster hatcheries. Brinnon, another “Census Designated Place” in Jefferson County, lies at the southwestern end of Dabob Bay. The 2010 Census counted 797 people in the CDP which is home to the oldest Boy Scout Camp west of the Mississippi, Camp Parsons, founded in 1919. The Quilcene Historical Museum helps visitors explore the history of both the Quilcene and Brinnon Areas. Vancouver named the bay at the northeastern end of the Quimper Pensinsula Port Townshend. When settlers arrived in 1851, they took the bay’s name for their new town. 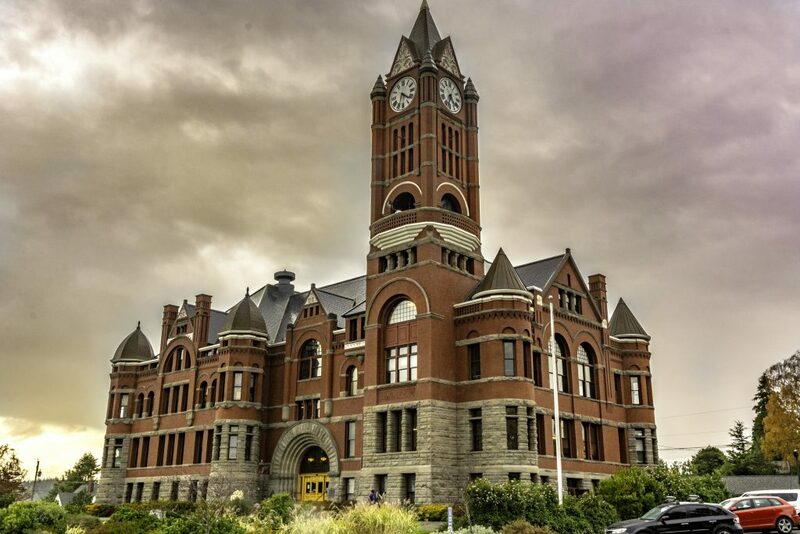 The only incorporated city in Jefferson County, Port Townsend (over time we lost the “h”) became the County Seat at the formation of the County. Located where the Straight of Juan de Fuca becomes Admiralty Inlet and then Puget Sound, Port Townsend seemed the logical place to be the Northwest’s major seaport. With the promise of railroad lines connecting the city both east and south, townsfolk dreamt of building a metropolis that would rival San Francisco. 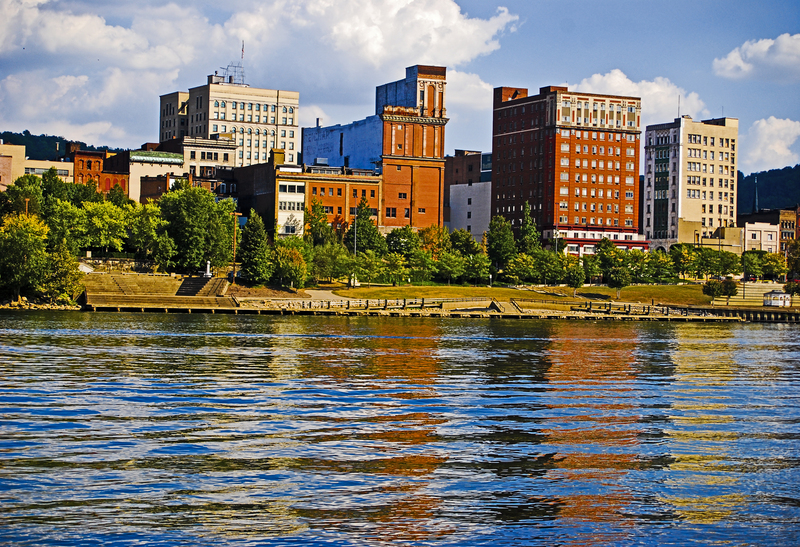 They built a beautiful city of Victorian architecture with stunning natural views out over the water. Unfortunately, the railroads never came and Seattle took on the role of seaport. The dreams died. The population of Port Townsend dropped almost 1/4 between 1890 and 1990, and would suffer two more such declines in 1920 and again in 1960. If there can be an upside to such drastic declines it is that there was no reason to demolish the beautiful Victorians and replace them with more modern structures. Today, the “City of Dreams” is home to 9,551 residents (2017 US Census estimate) and has a thriving cultural and recreational presence. Port Townsend, and indeed Jefferson County, has become a retirement haven. As of 2010, over one fifth of the city’s population was over 65, and the median age of residents was 53. At the time of writing (April, 2019), I have visited Jefferson County, Washington twice. In 1972, I traveled with a Swiss friend up the Pacific Coast on US Highway 101. We then took the ferry from Port Townsend to Coupeville on Whidbey Island. In 2016, I drove myself along the same route heading north. On this trip, I turned south at Port Townsend, crossing the Hood River Bridge into Kitsap County. My photographs from the 1972 trip did not scan well and were not used in this essay. The rain was so heavy in 2016 that most of my photographs were marginal at best. That said, I look forward to future visits to Port Townsend and Jefferson Counties and will have my camera in hand. All photographs are available through my on-line gallery at RedBubble.com, and can be purchased in a variety of forms, including pillows, clocks, t-shirts as well as regular photographic prints. Should you desire something here that is not available at RedBubble, let me know and I will make it available. Should you wish a printable pdf file of this article (both text and photos) you can get it at my designrr page. Powered By by Inkhive Themes. © 2019 bryanspellman. All Rights Reserved.